Seagate's $1.38 billion purchase of Samsung's hard disk drive business sends a bold message to investors. SCOTTS VALLEY, Calif. ( TheStreet) -- Seagate's ( STX - Get Report) $1.38 billion purchase of Samsung's hard disk drive business sends a bold message to investors concerned about the company's growth potential. "This gives Seagate greater reach, a greater share of the market," said Greg Schulz, senior adviser at consulting firm Server and StorageIO Group. "This is Seagate saying 'there are still opportunities for us' -- they have to send that message out to investors." Seagate will buy Samsung Electronics' hard-disk drive business for about $1.38 billion. 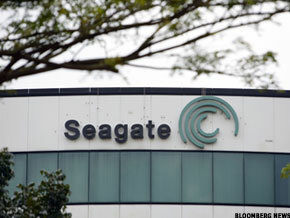 Seagate's stock has dipped almost 10% over the last 12 months amid concerns about the broader hard disk drive market. Sales of hard disk drives declined in the first quarter of 2011, according to tech research firm iSuppli, which noted that tablets, which do not use hard disks for storage, are eating into the market for traditional netbook PCs. Reuters, citing Rodman Renshaw analyst Ashok Kumar, said that a combined Seagate/Samsung will account for 40% of the hard disk drive market. Rival Western Digital ( WDC - Get Report), which is spending $4.3 billion to acquire Hitachi Global Storage Technologies, will hold around half of the market, according to Kumar. Despite some weakness in consumer demand, though, Server and StorageIO's Schulz says that enterprise hard drive shipments remain healthy. "There's no such thing as a data recession," he told TheStreet. "People are still processing and storing large volumes of data for a long period." "The demand for storage is accelerating," said Steve Luczo, the Seagate CEO, during a conference call with analysts on Tuesday. "The petabyte growth is very strong and has been over the last six to eight quarters." A petabyte is a measurement of storage capacity that's equal to half of the total content stored at U.S research libraries. More specifically, Seagate expects that the Samsung deal will extend its customer reach in China, one of the world's fastest growing economies, as well as elsewhere in southeast Asia. The two companies are also entering into a supply pact for NAND Flash memory, which is widely used in the booming smartphone and tablet markets. Seagate will pay 50% stock and 50% cash for Samsung's hard-disk drive business. Under the terms of the deal, Samsung will take a 9.6% stake in Seagate. The Seagate/Samsung deal also provides further evidence of consolidation in the hard drive market, coming just over a month after WDC's Hitachi deal. "We view consolidation as a generally positive step for the hard disk drive industry," said Goldman Sachs analyst Bill Shope, in a note released on Tuesday. "It not only increases the component buying power and capital efficiency of the HDD vendors, but it also ensures each vendor has a diversified portfolio of patents and product families." Seagate released fiscal third-quarter results before market open Tuesday, reporting revenue of $2.7 billion, down from $3.05 billion in the prior year's quarter but above the $2.66 billion predicted by analysts. Adjusted earnings posted just below consensus at 25 cents a share, down from $1.05 a share in the same period last year. Excluding items, analysts surveyed by Thomson Reuters had been looking for earnings of 27 cents a share. The company shipped 49 million hard disk drives during the quarter, compared to 50.3 million in the same period last year. Seagate's shares dipped 34 cents, or 1.91%, to $17.50 on Tuesday.